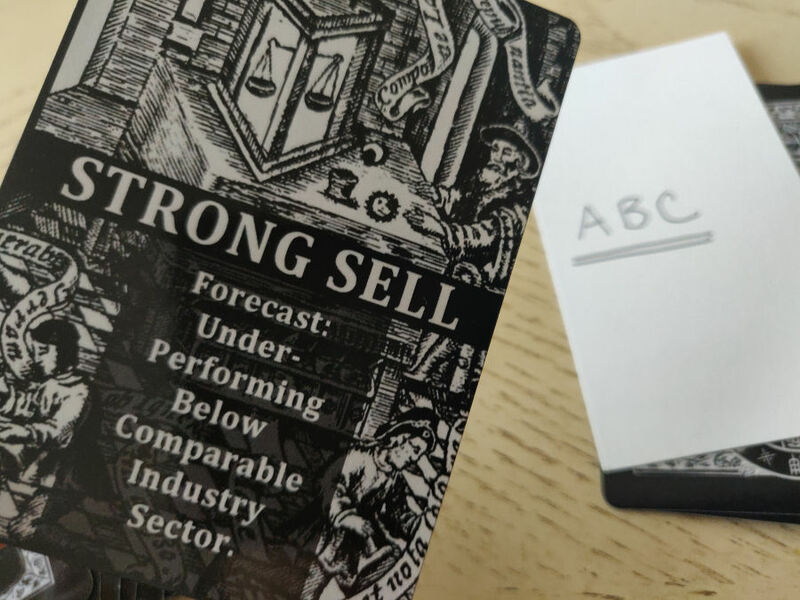 The Investor’s Oracle is a simple and straightforward 25-card divination deck for equity markets, printable at your standard playing card size, or 2.48 in. x 3.46 in. (63 mm × 88mm). The idea for creating this deck came about at a dinner table when the Hubby and several of our friends, who are also either financial analysts or avid investors in the stock market, were talking about the volatility of the market (I say that like I have any idea what that even means…) and how at this point, a monkey with a dartboard can do better at making investment decisions than the veteran analysts. Innocently, I raised the question, well, head to head who do you think would do better? The witch with zero experience in the stock market who relies on her Craft or the veteran analyst. That night I got to work on crafting my own divination deck to compete, me versus Hubby. He’d use his sound experience as a veteran analyst while I would literally pick a card from my divination deck and make investment decisions based on my pick. 9 times out of 10 I didn’t even know what the ticker symbols Hubby was giving me stood for. Hubby continued to test me and was rather amused at how “accurate” some of my decision-making was. And then eventually, because it was getting eerily consistent (and we were literally reaping in the financial gains on my “crapshoots”), it wasn’t fun and games anymore and he hijacked the divination deck for himself. There’s nothing innovative or special about the deck structure itself. There are only 25 cards and if you can read English, then you can work with these cards competently. No learning curve involved. This is the third video presentation of Sightsee the Tarot, a new series I’ve started on my YouTube channel. If you haven’t watched the previous videos on a psychological approach to the tarot, the Nine-Card Open Face Spread and Self-Help Tarot Journaling (Tarot Counseling), watch those and then return to this session, or at the very least, watch the first three minutes of the Self-Help Tarot Journaling video for the theoretical model distinctions between predictive tarot reading and tarot counseling. I’ll be making reference to those distinctions as we explore predictive tarot reading. Please note that intermediate proficiency with reading tarot in spreads is presumed. I proceed with explaining Gray’s approach with the understanding that you already know how to read the cards. Also, in terms of a tarot spread, this particular method can be rather vague, and relies heavily on the skill of reading cards in pairs. So elemental dignities also comes in to play. Nonetheless, armed with a book of card meanings, I think this may still be a good video workshop for the total tarot beginner to work through. So do not be dismayed, tarot beginner! Still give this tutorial a shot! Angie Green, the creator of the Simple Tarot, is running an incredible giveaway for the Beginner’s Kit! You can read a review I did of the deck here. I get the incredible opportunity to team up with her and run a giveaway through my channel for one of her Simple Tarot Beginner Kits! The winner will receive a Simple Tarot Beginner Kit by Angie Green. 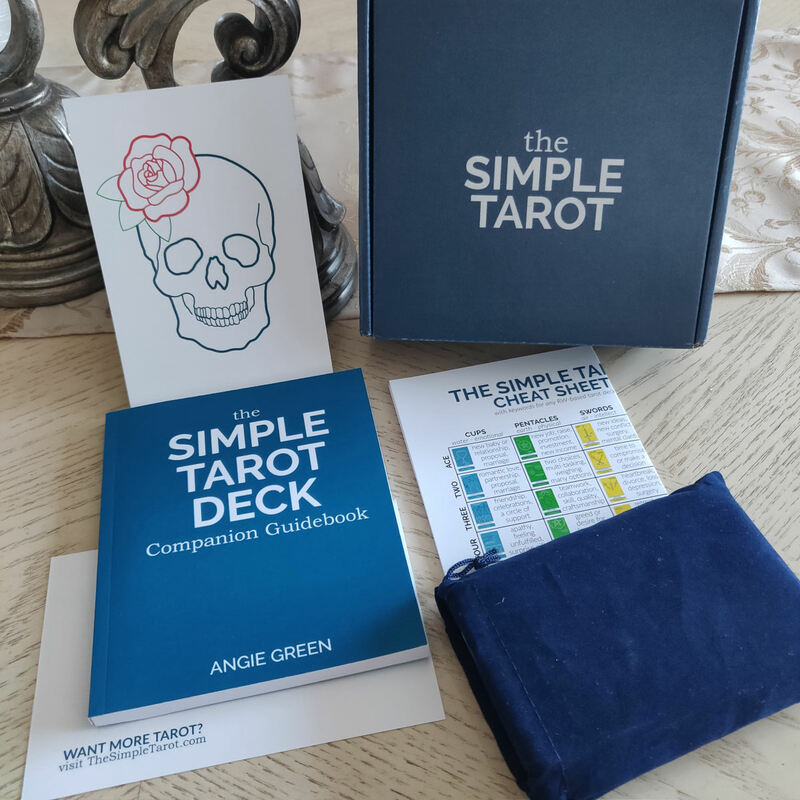 In addition to winning Angie’s Simple Tarot Beginner’s Kit, you will also win and receive a signed copy of Holistic Tarot. About the copy of my book: Note that this is from the first print run of Holistic Tarot. There have been subsequent edits, revisions, and many other print runs, so just know that this edition has all the original typos and errors. It’s from the very first batch of HT ever printed. So maybe it’ll be worth money someday? Who knows. Anyway. a plush velveteen drawstring bag for your tarot deck. U.S. residents only. This giveaway is limited to those living in the United States. Second, I ask that more seasoned tarot readers to please sit back on this giveaway. 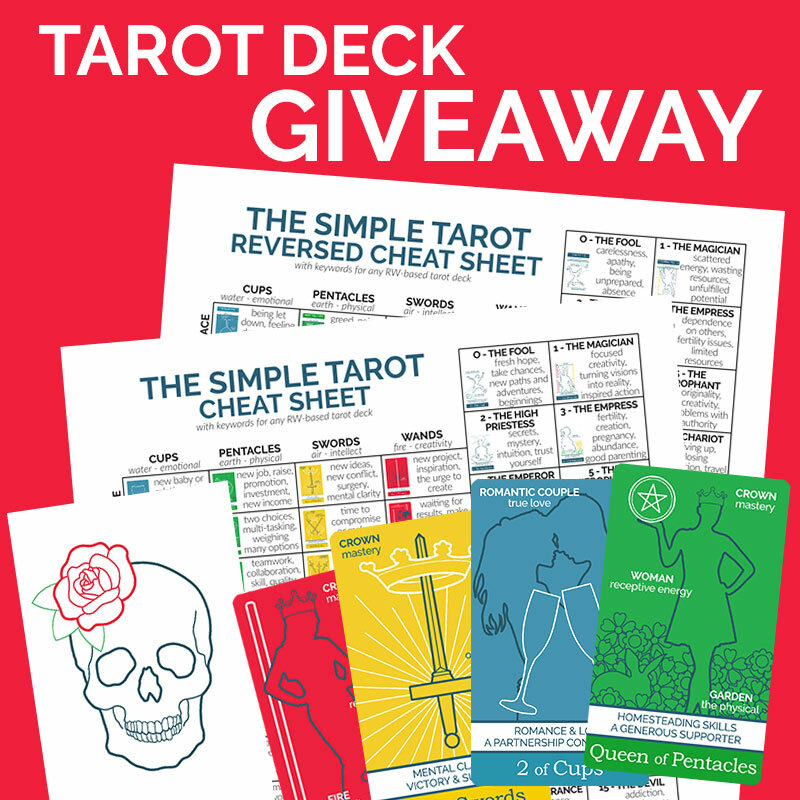 I’d like this giveaway to be reserved for those just starting out on their tarot learning journey. Share any one of the below photos of the Simple Tarot on Twitter, Instagram, or as a public Facebook post with the hashtags #thesimpletarot and tag the deck creator @thesimpletarot and in your caption, share why you’re excited about this tarot deck and giveaway! 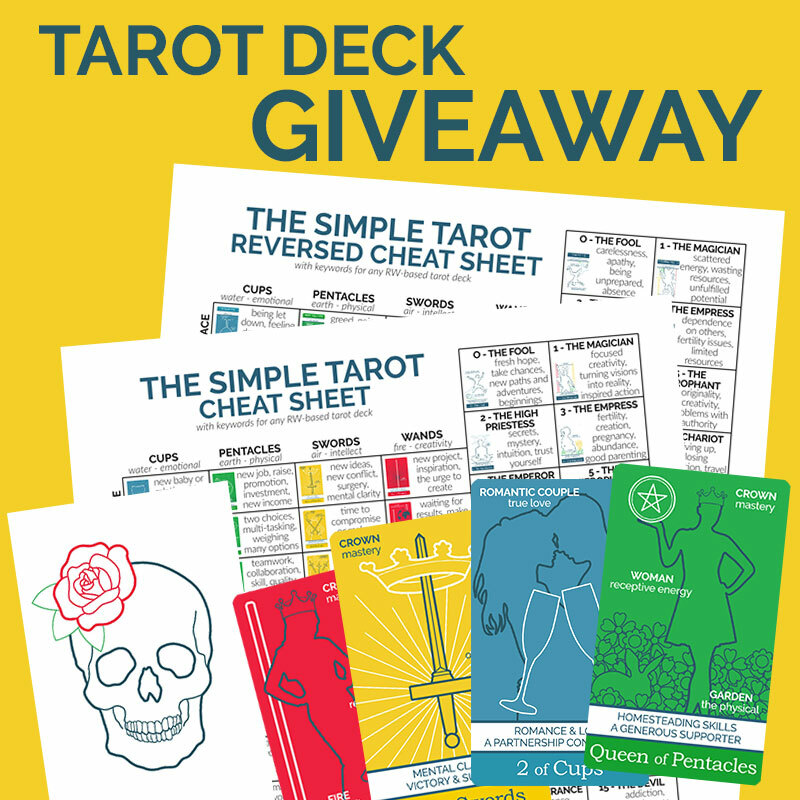 Or you can gush about all the cool free tarot resources Angie gives away here: https://thesimpletarot.com/resources and share that link. Link to a posting from this website (benebellwen.com) or a video from my YouTube channel (www.youtube.com/c/BenebellWen) that you really liked and felt was insightful to you, including a few short words on why you liked it. (2) Hyperlink to your completed To-Do #2. When you leave your comment, please be sure to include the e-mail address that you’ll check in the event you win, because the winner is going to be notified on March 16, 2019 by the e-mail of record per the comment you’ve left to this blog post. You do not need to publicize your e-mail address in the comment! It can stay private! I will see your Email address, while it remains unpublished on the blog post, and will use that Email address to contact you in the event you’ve won. Only those who leave a comment below with a working e-mail address (and who reply within 24 hours to the notification that you’ve won) are eligible. The winner will be announced here on this post on March 16, 2019. I will e-mail you to let you know you’ve won and will need your full mailing address. I’ll mail you the Holistic Tarot starter kit, give your name and address to Angie, and she will mail you the Simple Tarot Beginner’s Kit. The name of each commenter to this blog post (To-Do #3) will be written on a slip of paper and put into a container. I’ll pull a name at random and film the drawing, which I will then post to my Instagram on March 16, 2019. On the same day, I’ll privately notify that individual via e-mail and update this post to announce the winner. Sorry, sorry I’m late to this! It’s been a hectic weekend! New Era Elements Tarot by Eleonore F. Pieper, Ph.D. 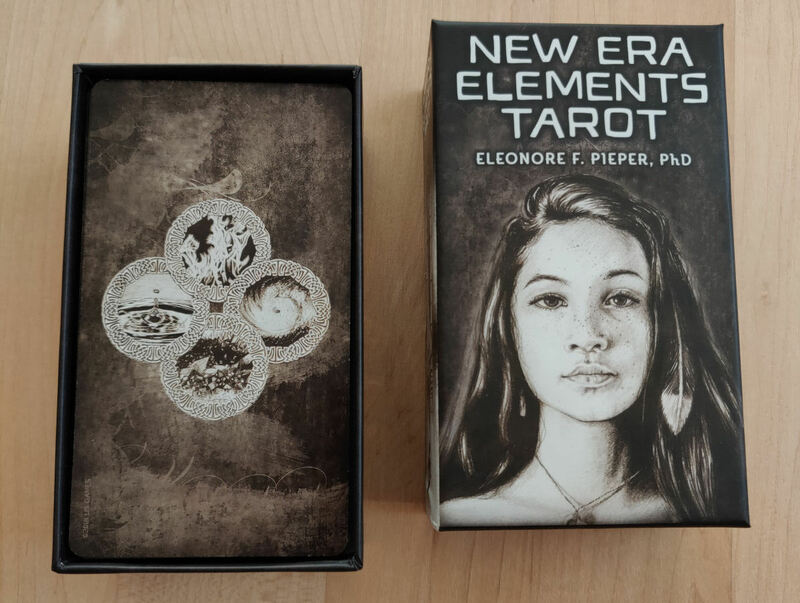 The New Era Elements Tarot by Eleonore F. Pieper is a modern deck that places the tarot archetypes in modern-day history and events. Sepia-toned, featuring brilliantly-detailed sketch art, New Era features some of the most beautiful artwork I’ve seen on a deck. Many of the images are difficult to look at, as you’ll see in this review. This is the second video presentation of Sightsee the Tarot, a new series I just started on my YouTube channel. If you haven’t watched the first presentation yet, the Nine-Card Open Face Spread from Jung and Tarot by Sallie Nichols, go watch that and then return to this session, because we’ll be building on what was covered about Jung and Tarot. Since this is a journaling-only session where the tarot cards you’ll be working with will appear across the screen for you, you won’t need your own deck and you don’t even need any knowledge whatsoever of the tarot. Attributions for the cards you’ll be journaling through are going to be provided for you, given through the perspective of Jungian archetypes and applicable in a psychological approach to the tarot. Start by downloading the supplemental handout linked below. It’s going to be a 10-page PDF file. You can print it out and write directly on the handout sheets, then add it to your tarot journal, or you can copy the questions longhand into your tarot journal and work directly from the pages of your notebook. This guided journaling session is intended to help you work through any anxieties or frustrations you currently face and arrive at different perspectives, gained insights, and realizations of the answer. For the first card we’re journaling through, you’ll be selecting from either Key 1 or Key 2 to represent you. You project your sense of identity out onto the archetype of either the magus or the high priestess and then work through prompts to gain a different perspective of yourself. This is insight into the inner divine masculine or inner divine feminine, and applying core counseling techniques in a tarot journaling prompt for yourself to help you better realize the anima or animus. Although I’m a straight female, Key 1: The Magus pulled at me more and I felt I identified more with the magus than the high priestess while going through this exercise, so I journaled with The Magus. In other words, you don’t just simply choose Key 1 because you’re a guy and Key 2 because you’re a girl. It’s more about how you identify with the archetypal energies these keys represent. For the second card, we’ll all be journaling through The Hanged Man from the New Era Elements Tarot as feaured in the video. There are many reasons I chose this card. In esoteric tarot, it’s considered the most important card in the tarot deck for truly understanding the tarot. It’s the card that facilitates the initiation (which comes after, in Key 13: Death), or transformation of consciousness. If you’re coming in to this journaling session with a sincere intent to work through a problem you’re facing, then more likely than not you feel a bit like the hanged man and need to figure out what next course of steps to take to progress forward. So it’s just a great card for processing current anxieties, fears, and roadblocks. Also, it kind of works out perfectly that when this video is produced, the year 2019, 2 + 0 + 1 + 9 = 12, so we’re in the year of the Hanged Man. Since we’re working with The Hanged Man as the known and conscious, the underlying Key with a common numerological denominator is Key 3 in the tarot, The Empress. Thus, working with that attribution, we journal through The Empress to retrieve insights from our own unconscious, the layers underneath our current known anxieties, fears, and roadblocks. The Emperor is a critical card in the tarot Majors to work through for personal sovereignty and achieving a sense of self-determination. It’s about independence and coming in to your own. It also happens to follow Key 3: The Empress in the consecutive order of the Majors. The coming year, 2020, will incidentally be an Emperor year (2 + 0 + 2 + 0 = 4). In the next video of this series, we will be moving out of the world of tarot psychology and into the realm of fortune-telling and predictive readings with the tarot, working with the techniques and reading style of Eden Gray. Be sure to check the Series Page for the scheduled upload. 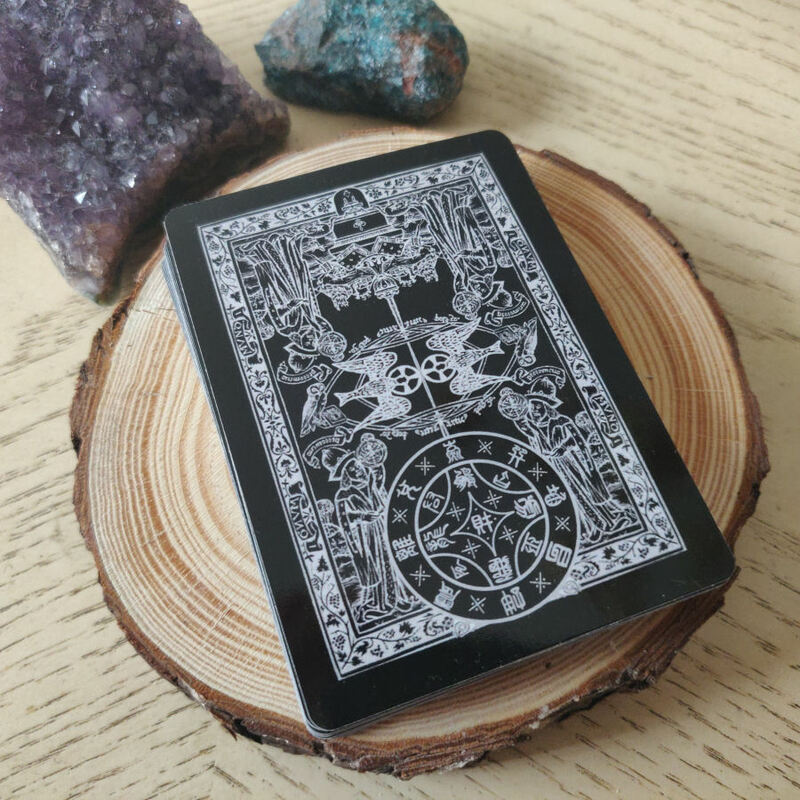 The Crow Tarot took the tarot world by storm in 2018 and became the talk of the town. It began independently-published and crowd-funded, raising $120,000 in what felt like a blink of an eye. It was fully funded on Indiegogo around this time, February of 2018, and here I am one year later, February of 2019, reviewing the mass market version of the deck by U.S. Games. 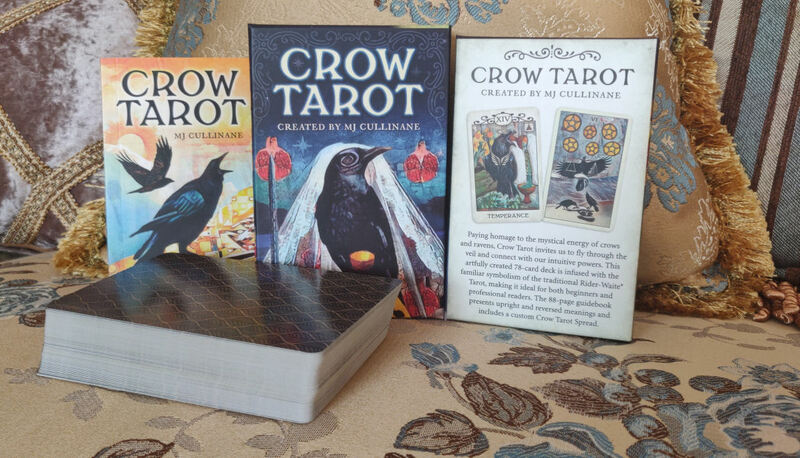 Given that most mass market decks take one to two years to go from contract to market, it’s evident that as soon as the Crow Tarot was picked up for mass publication, it was expedited to the front of the line. And no wonder! The deck is absolutely stunning. Margaux Jones (MJ) Cullinane is a Seattle-based artist and graduate from the prestigious Parson’s School of Design. I couldn’t definitively identify the medium of the artwork in this deck, but on Cullinane’s bio page in the companion book, she notes that her unique and signature digital collage technique was self-taught and since that’s the only artist’s medium mentioned, I’m guessing this deck is rendered by that signature digital collage style.